Hassan book depot has invited a job circular are many posts. Hassan book depot and the reputed institution is jononi publication. Some people will be appointed under the Hassan book depot. Applicant should have qualification in graduate and postgraduate. ACI Godrej Agrovet Private Limited has invited a job circular are many posts. It is a well known company. Only Bangladesh interested candidates can apply for this posts. Available jobs in ACI Godrej Agrovet Private Limited. Food and Agriculture Organization of the United Nations has invited from interested and qualified candidates for this post. Only Bangladeshi Interested candidates can apply for these posts. Sahriar Steel Mills Limited (SSRM Steel) is a well known company in Bangladesh. Recently they has been published a recruitment circular. Available jobs in Sahriar Steel Mills Limited Company. 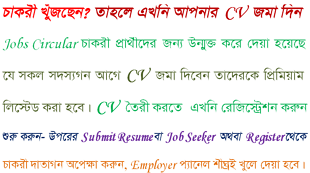 PCF Feed Industries has invited a job circular are many posts. Some people will be appointed under the PCF Feed Industries.